I love red, that's what I said. Red is the warmest of all the colors. It symbolises love, life and vitality. Red is also the color of power and courage. 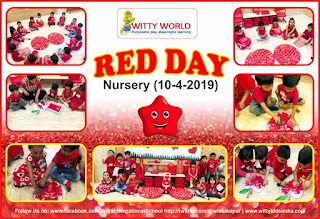 On Wednesday 10th April, 2019, the little Wittians at Witty World, Udaipur celebrated “Red Day”. They came beautifully dressed in red colored clothes. The class was adorned with red color objects.Children enjoyed doing sponge dabbing on the apple cutout.They also ate red colored snacks brought by them in their tiffin. Therefore through fun way method children learnt about a new color called 'RED'.